Dr. Melina Roberts delivers a powerful course on how to use foods to build your health, activate healing and significantly improve your present health as well as build your health for the future. Learn what you need to be eating to build long-term, life-long optimal health directly from Dr. Melina Roberts. Heal your digestive tract and enable your body to heal itself. Learn the problem foods, why they are problem foods and alternatives that you can eat. Learn the building blocks of the human body, what we need to be eating to build the highest level of health in your body. What proportions of building blocks you should be eating depending on your activity level. Learn why the microbiome is important and how to improve your microbiome. This is a framework for building health in your body. Learn the six problem foods that may be blocking your body from functioning optimally, why they are problem foods and what are alternative foods. Learn what the real building blocks are of the human body, the foods we need to be consuming to build health and longevity. Learn the proportions of each of the building blocks you should be consuming. Learn the biggest mistakes most people are making in terms of carbohydrate consumption, even if you think you are eating clean and healthy. Learn which carbohydrates you should be consuming and which ones you should be limiting and how that can differ based on your activity level. Learn what are clean proteins and which proteins you should be avoiding and why. Learn what fats and oils are healthy and what fats and oils you should be staying away from. Learn the mistake that many people are making in terms of fat consumption. Can you be consuming too much fat? Learn why the microbiome is important, tactics and ways to improve your microbiome. Learn extra ways you can improve your health by learning more about GMOs, organic foods, reading labels. Get downloadable handouts that clearly list which foods we should be consuming and which foods we should be avoiding. Get a 28-page three-day meal plan PDF that is complete with recipes and pictures to help you implement this framework. Building Health Course - Online Course ($97 value). Watch the video on this page for the full curriculum. Learn why the digestive tract is important and learn the function of the digestive tract. Learn about bowel movements, stool chart, and ideal bowel movements. Learn what the problem foods are, why they are problem foods and alternates that you can eat. Learn the building blocks of the human body, which foods are the healthiest options, which foods are the best depending on your activity level and the proportions of each building block for your optimal health. Learn about the microbiome, why the microbiome is important and reasons we are seeing a decline in the diversity of the microbiome. Learn tactics to improve your microbiome and learn ways to build a healthy microbiome. Learn how to heal the lining of the digestive tract including the mucous membranes and tight junctions. 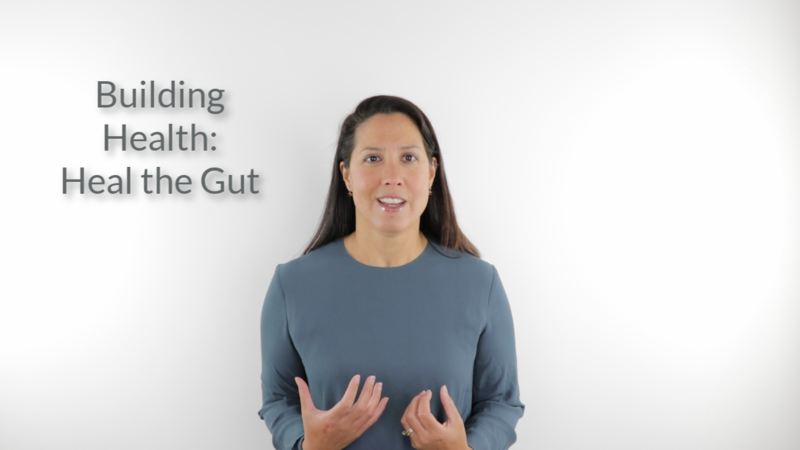 Learn how I put all of the information together and approach healing the gut for my patients. SURPRISE BONUS: PRIVATE Building Health Course Community with Dr. Roberts and fellow students for an ENTIRE year ($2495 value). Ask Dr. Roberts, author and leading authority in the field of naturopathic medicine, anything you want! She's in the private community forum every week taking your questions! That's $2709 of value and training! ....BUT today you get ALL of this for just $59!! Learn what we need to be eating to build long-term, life-long optimal health. Learn the problem foods, why they are problem foods and their alternatives. Learn the building blocks of the human body, what we need to be eating, in what proportions and how it may be different based on our activity level. Heal your digestive tract and allow your body to heal itself.